Today Aether announced that Aether and University of South Australia (“UniSA”) have begun to collaborate for a project, funded by a Bill and Melinda Gates Foundation grant, to pursue a 3D bioprinting research breakthrough in the field of contraception. Bill & Melinda Gates Foundation, also known as the Gates Foundation, is said to be the largest transparently operated private foundation in the world. Bill and Melinda Gates, along with Trustee Warren Buffett, have donated billions of dollars to drive positive change, largely in healthcare, in the US and worldwide. The project will be led by UniSA’s Dr. Anton Blencowe. The latest Aether 3D bioprinter shipped to the Blencowe Research Group at UniSA to support their 3D bioprinting program and the development of screening platforms for pharmaceuticals, including models for screening contraceptives supported through the Bill and Melinda Gates Foundation. According to UniSA’s successful grant application, the goal of this ambitious project is to develop a 3D bioprinted in vitro oviduct model that reproduces the spermatozoa capacitation process for the screening of novel drugs and natural product libraries to target spermatozoa capacitation in the oviduct as a new contraceptive paradigm. The in vitro oviduct model will be used to identify male-specific contraceptive targets that prevent spermatozoa capacitation. The contraceptive will only affect the male spermatozoa, and have no or limited effect on the female physiology or endocrinology. While Aether has already shipped early beta units to a select few researchers located throughout the globe, Aether has now shipped UniSA the very first Aether 1 beta unit to feature several major new upgrades, including a completely revolutionary, Computer Vision Automatic X/Y Offset Calibration System that is far more powerful, useful, and versatile than anything in existence today. In addition to providing Dr. Blencowe’s research team with access to the first highly upgraded new Aether 1 beta unit, Aether will support their research by providing the technical and engineering resources needed to ensure Aether 1 can allow the team at UniSA to reach their goals for the project. Aether may also create new technologies, features, and functions in order to open up new research possibilities for UniSA and the Gates Foundation. Aether is a San Francisco technology start-up and the creator of Aether 1 Bioprinter, the world’s most advanced 3D bioprinter. 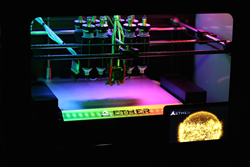 Aether 1 allows users to simultaneously print with up to 24 materials including filaments, liquids, viscous pastes and gels. Aether 1 features up to 8 different fabrication methods, and comes with 4 completely revolutionary automation features utilizing cutting-edge technologies such as computer vision. In addition to being the world’s most advanced 3D bioprinter, Aether is far and away the most cost-effective option on the market.